In Vermont, it’s hard not to observe Earth Day every day. There is such immense natural beauty here, that the grandeur of it impacts native Vermonters on a daily basis. But on Earth Day, everyone comes together to clean-up, conserve, and learn about all the ways to protect Mother Nature. So, check out these events and ideas for celebrating Earth Day in the Green Mountain State. What better place is there to celebrate Earth Day at than a museum of natural science? The Nature Museum at Grafton was established in 1989, and its “collections focus on the natural history of northern New England,” according to their site. Exhibits on local flora, fauna, and geology spill over into schools and environmental programs, and Earth Day at the museum promises a swinging party and even a wild raptor presentation. 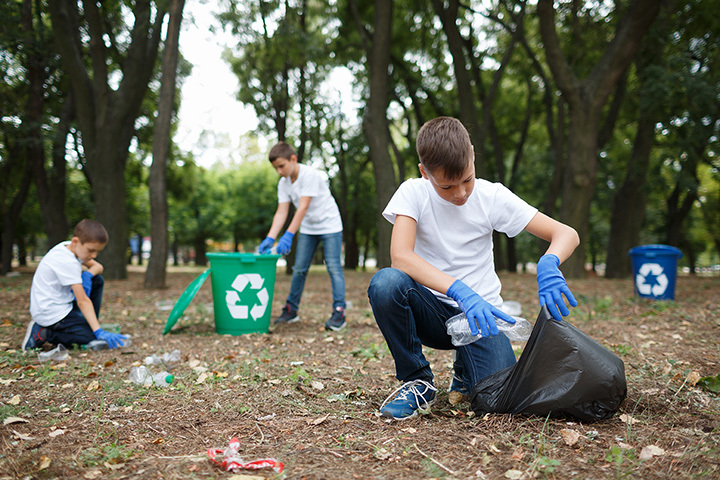 Established in 1970, Green Up Day is a day in the springtime where Vermonters get up and get outside to pick up trash in their local areas and keep their green state, well, green. A mini Earth Day in and of itself, even Vermont Transit gets involved. Now the Vermont Community Foundation has offered their help, so, even though Green Up Day is traditionally a week or two ahead of Earth Day, Mother Nature appreciates the kindness and attention. Earth Day can also be about education, so attend a lecture at the University of Vermont on the environment. The school invites guest speakers to come in and educate the student body and public on ways to help sustain this planet. Why not go to a fair on Earth Day? An earth fair, that is. With more that 150 workshops on subject like homesteading, animal husbandry, natural health, organic gardening, and renewable energy, there is no shortage of information to soak up. The goal is to educate and entertain, but a full boat of vendors offer items, too, like, tools, seeds, food, clothes, solar tech, and more. No one really knows when planting a tree for Earth Day became a tradition, but it is a real no-brainer if you think about it. Trees offer many benefits like absorbing air pollutants, offering shade and reducing cooling costs, providing wildlife habitat, and preventing erosion. A report from the USDA Forest Service even indicates that trees add more than 18 percent to the value of a suburban home. The Echo Leahy Center for Lake Champlain will be celebrating Earth Day, in all its mud and glory. Sixteen fun-filled days swarm with muddy activities and games, including a mud fling, muddy faces, mud tables, mudsicles, and a mud music festival headlined on Earth Day itself. The event runs approximately during the last two weeks in April. On Earth Day, hang out with the folks at this member-owned, community-based food organization. With more than 8,000 member-owners and 2,000 local products, they are not too big to give back to the community. Recently designated Vermont Green Grocery Environmental Leaders, giving back is what they have always been about. That is why they are celebrating Earth Day with a day-long event that features food, activities, and a solar-powered bounce house! In order to keep the hazardous stuff out of landfills, many towns in Vermont offer special recycling during the month of April. Sustainable Woodstock takes it one step further, recycling more than three tons of discarded computers, televisions, batteries, and other electronic components from homes and businesses. They have also shredded over one ton of sensitive documents and collect cell phones and ink cartridges during a program that is repeated annually on or around Earth Day. Follow the link to volunteer, or volunteer in your town. In the spirit of Earth Day, Long Trail will offer eco-friendly beer all day long. Acquiring Wolaver’s Organic Beer in 2010, Long Trail now holds the keys to organic, eco-friendly beers like, Wolaver’s Pumpkin Ale, Wolaver’s Wild Flower Wheat, and Alta Gracia Coffee Porter. So, support Earth Day by having a cold one with Long Trail and supporting Mother Nature at the same time. Say thanks to Mother Earth as you get lost along her bucolic 272-mile footpath into the wilderness. Built between 1910 and 1930, the Long Trail spans Vermont’s borders, South and North. Along the way, there are some 185 miles of side trails and around 70 campsites, and most of the hikes follow the ridgeline of the Green Mountains, passing along some of the state’s highest peaks.